A procession of yellow shirts marched across the Lorain Carnegie Bridge this afternoon. They held a giant banner with the words, “Stand against Trump, stand for American values,” across it. “We are all doctors, nurses and medical professionals,” said organizer Christina Stewhower, 31, of Cleveland. Their group is called Love Trumps Hate. 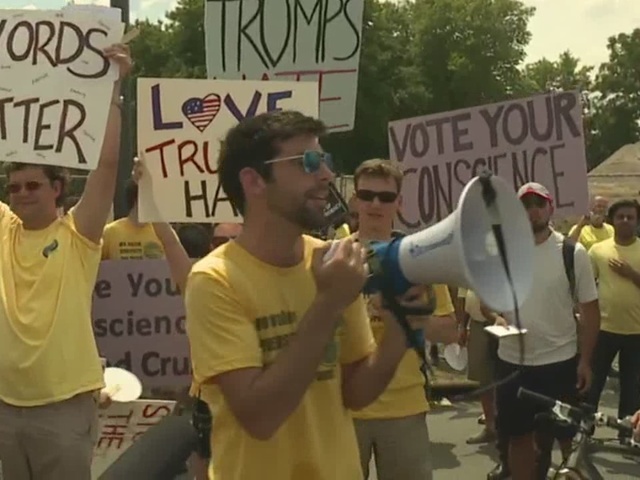 Stewhower explained they were protesting Trump for his, “Negative tone and hateful rhetoric,” particularly towards immigrants, Muslims and minorities. The group came together to support their immigrant and minority colleagues in the field. The organization began locally, but has used social media to spread their message. This attracted participation from people in other states. As the march continued a pocket of light purple shirts appeared behind them. “We are with Grassroots Global Justice,” said Stefany Olivas, 26, of Albuquerque, New Mexico. The group supports grassroots movements and organizations. “Today we are here to support Love Trumps Hate,” said Olivas. This is not the group's only mission. “We are also here to demand justice for the murder of Berta Caceres,” she explained Caceres was a grassroots organizer in Honduras who did work for indigenous people.